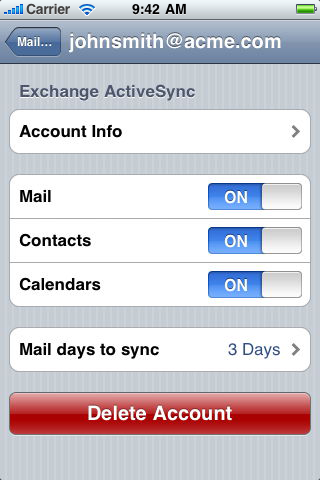 When Microsoft Exchange mail is configured on iPhone or iPod touch, the default setting for "Mail days to sync" is set to 3 days. To increase or decrease the amount of email messages displayed in your Microsoft Exchange mail accounts (Inbox, personal folders, Sent, etc.) change the "Mail days to sync" for the account. Note that the Mail setting to set the number of messages on the iPhone (tap Settings > Mail, Contacts, Calendars > Show) does not apply when using a Microsoft Exchange account.